Hugh Jackman and Tony, “hoppy” together! Lately, I’ve become increasingly disillusioned with “Awards” telecasts. I’ve had my fill of the meaningless hype surrounding these shows that seem to focus more and more of their attention on designer gowns, million dollar gems, unseasoned presenters and off-color and demeaning shtick instead of on the craft they’re supposed to be honoring. Audience demographics and ratings are the engines that drive most of this drivel. But after watching Sunday night’s telecast of the 68th annual Tony Awards® on CBS (6/8/14), hosted with vim and a lot of vigor by actor Hugh Jackman, I’m happy to report that I’m back on board with Tony. Granted the annual Tony Awards telecast is usually classier than most awards shows. Afterall, the mission of the American Theatre Wing is to honor legit Broadway dramas and musical theatre. But last year’s Tony extravaganza, despite the tireless performance by multi-talented host Neil Patrick Harris, quickly lost its luster. Tedious self-serving speeches and editing glitches turned those festivities into a snooze fest. In contrast, the 2014 Tony Awards presented on Sunday by Tony Award Productions, a joint venture of The Broadway League and the American Theatre Wing, were the best ever! They were again broadcast from New York City’s landmark Radio City Music Hall, a perfectly appointed venue to showcase complex live performance vignettes from Broadway shows. And Hugh Jackman was more than a match for beloved serial host Neil Patrick Harris. It’s no surprise that Jackman can hold his own as a talented actor, singer and dancer, but who knew he also hops, taps and raps? 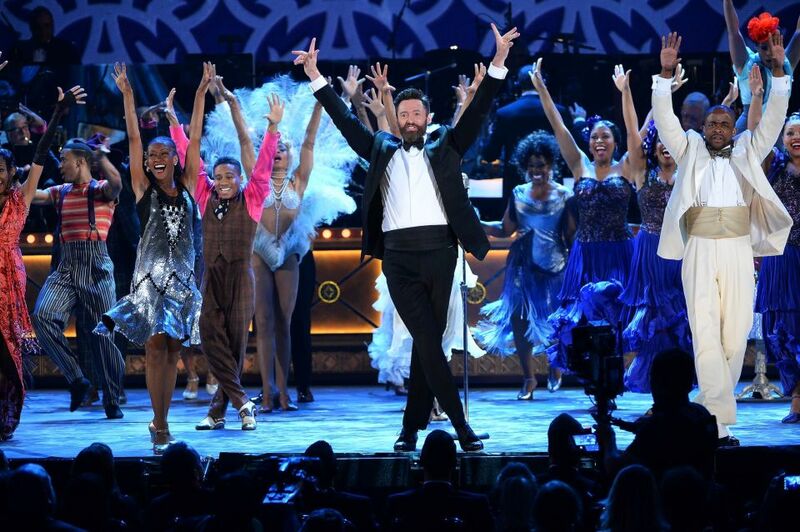 Actor Hugh Jackman captivated the crowd as host of the 68th annual TONY AWARDS on CBS, Sunday, June 8. Photo: Theo Wargo/Getty Images for Tony Award Productions. Jackman literally hopped his way through a comical opening segment, maneuvering his way into and around Radio City’s cavernous backstage, orchestra, audience and onto the stage, welcoming nominees, their guests and seamlessly seguing into a rousing number from Best Musical nominee After Midnight featuring Fantasia, Glady’s Knight, Patti Labelle and a cast of world-class hoofers. It should be noted that throughout this tour de force opener, Jackman was barely winded. Also cleverly entertaining were his musical intros to the Best Actress nominees and his rap twist of “Music Man” lyrics with LL Cool J and T.I., whoever that is. In short, Hugh was fabulous and always gracious–no-off color, snarky remarks–and on his game throughout the show. 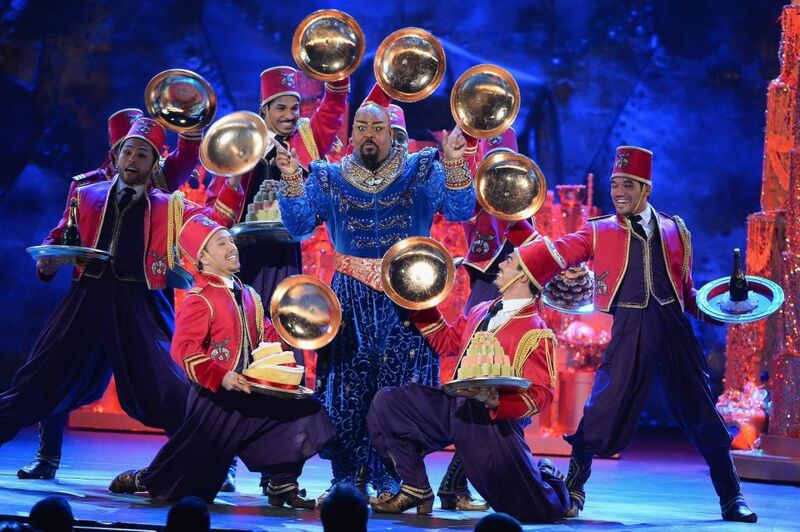 Tony winner James Monroe Iglehart brought down the house in this number from ALADDIN. 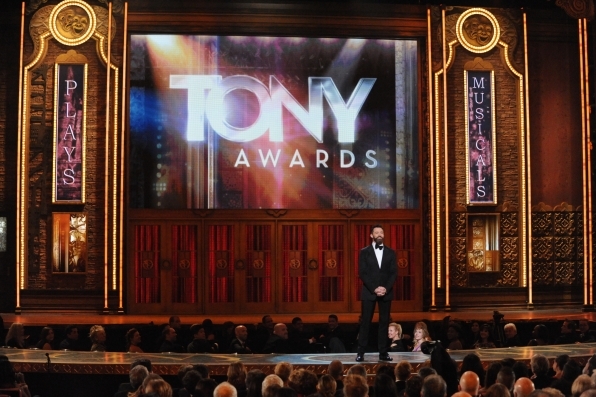 Photo: Theo Wargo/Getty Images for Tony Award Productions. Other highlights included the performances by Tony winners Neil Patrick Harris (Hedwig and the Angry Inch), Jessie Mueller (Beautiful–The Carole King Musical) and James Monroe Iglehart (Aladdin); as well as the surprise arrival of singer/songwriter Carole King and her show-stopping performance of “I Feel the Earth Move” with Ms. Mueller. Best Actor in a Musical nominee Jefferson Mays performed a riotous quick costume change intro to the Award-winning Best Musical A Gentleman’s Guide to Love & Murder. And the magic of live theatre was clearly in evidence during the climactic fight from Scenic Design Award-winner Rocky and the precision exhibited by Best Choreographer nominee Susan Stroman’s tapping mobsters from Bullets Over Broadway. 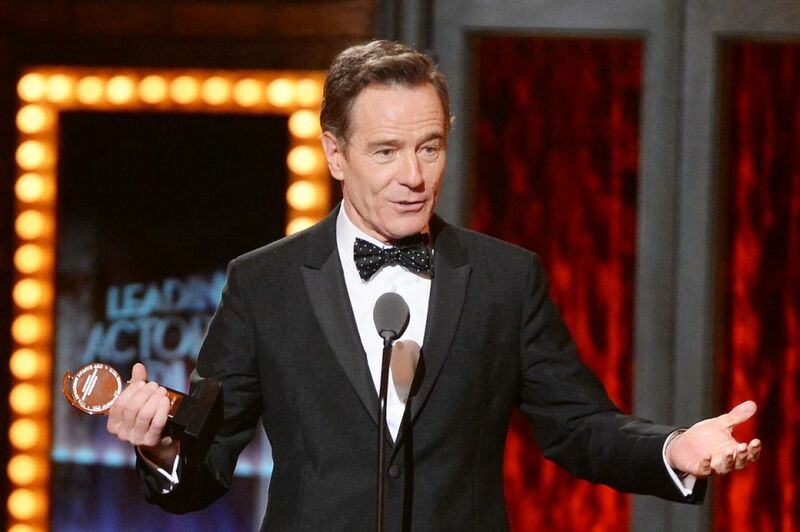 Can Bryan Cranston’s year get any better? Now he’s a Tony winner for his riveting turn as LBJ in ALL THE WAY. Photo: Theo Wargo/Getty Images for Tony Award Productions. The musical numbers were well-integrated and, for the most part, excellent incentives to buy tickets, as were the wins and speeches by actor Bryan Cranston for “All the Way”; actress Audra McDonald (A record-breaking sixth Tony win!) for “Lady Day at Emerson’s Bar & Grill”; and supporting actor Mark Rylance (whose win for “Twelfth Night” prompted him to remember and honor blacklisted American actor Sam Wanamaker for his contributions to Shakespearean theatre in the U.K.). In short, the show was a great showcase for Broadway and the theatre, in general, while still giving space to cross-over talent from other mediums, including Sting, Jennifer Hudson and Gloria and Emilio Estefan, who all represented upcoming Broadway shows. True, I wasn’t enamored by overhyped Idina Menzel and her lackluster number from “If/Then,” or the long-winded, self-aggrandizing thank-you speech by one of the producers of the Best Musical, A Gentleman’s Guide to Love & Murder. And he may have an intriguing name–Darko Tresnjak–but this Broadway newcomer, who also won a Tony for “A Gentleman’s Guide,” seemed a tad too impressed with himself. I found it amusing that he appeared oblivious and unimpressed by the fact that he was receiving his directorial award from Clint Eastwood. This entry was posted in Theater, Theatre, TV and tagged A Gentleman's Guide to Love & Murder, Audra McDonald, Broadway Musicals, Bryan Cranston, Carole King, CBS, Glenn Weiss, Hugh Jackman, James Monroe Iglehart, Mark Rylance, Neil Patrick Harris, Radio City Music Hall, Ricky Kirshner, The American Theatre Wing, The Broadway League, The Tony Awards. Bookmark the permalink. It agree with your assessment, Judy. This was one of the best award shows I’ve seen in ages; Hugh Jackman was fantastic and the show snippets made we want to go see some of the shows.